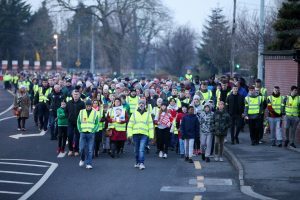 UP TO a thousand residents marched by candlelight on Saturday in memory of a young teenager who was knocked down and killed outside his home in Sallins. In a moving tribute to the memory of Dane Loakman and in protest at the lack of response on road safety from Kildare County Council, the large gathering marched in silence through the village on Saturday afternoon. Sixteen-year-old Dane Loakman died when he was hit by a van on the busy Clane Road in Sallins in November of last year. The popular teenager from Castlefen estate was crossing the main road to catch the school bus. Following Dane’s death, Sallins Community Council established a road safety group and put together the case for safety improvements in village. Before the march set off, he spoke of the pain that Dane’s family endure and explained that Dane’s mother Alison was fighting for road safety measures so that no other Sallins family would have to go through the same pain. Alison spoke also. She thanked everyone for taking part in the march and said the support from the community was a real comfort to the family. “The wide, open, straight road where Dane lost his life is lethal to cross and must be made safer by slowing cars down – not asking them to slow down with signs, but forcing them to slow down by narrowing the road and with speed bumps or cushions,” said Mr Carpenter. “The promised new road signs, while welcome, go nowhere near far enough.